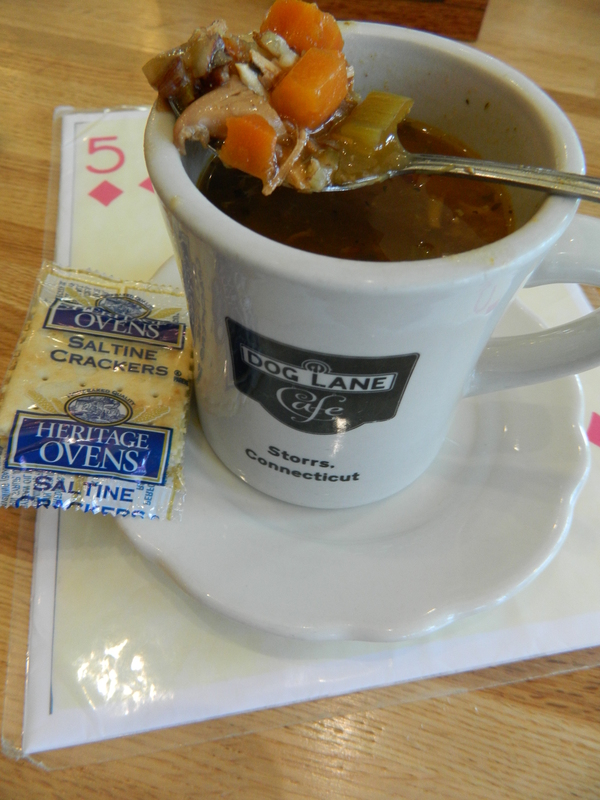 Dog Lane Cafe at Storrs Center in Connecticut was a show of good faith that has become a success. Located across the road from the main University of Connecticut campus which is tucked into the rural Connecticut countryside, this European/American style cafe holds the anchor spot for the still relatively new mixed use center, that back in 2005 was said to have been struggling to attract tenants. 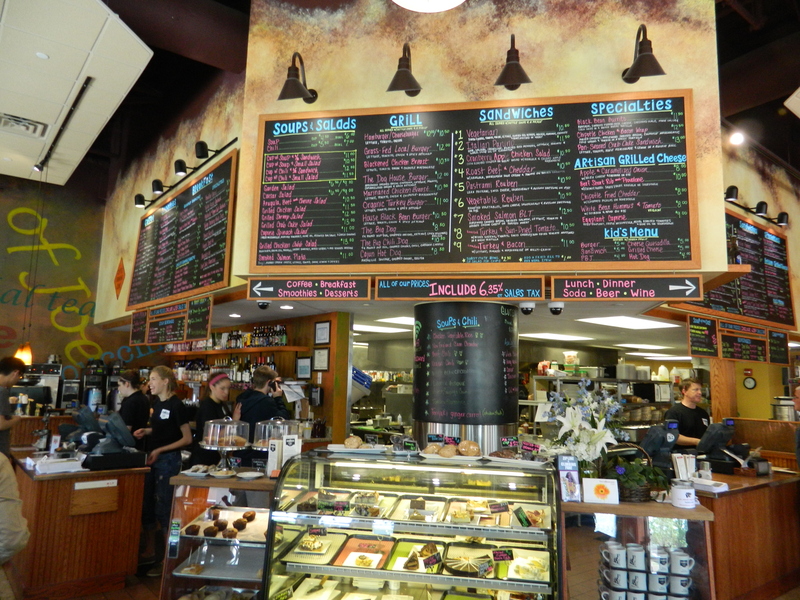 On the day of my recent visit, the cafe was bustling with students and adults – attracting the latter by design. Brothers Barry and Brian Jessurum, business partners in Dog Lane Cafe’s sister restaurants, the hugely popular Vanilla Bean in Pomfret, and 85 Main in Putnam, reportedly “saw the potential” for the Storrs development project so Barry Jessurum joined the Mansfield Downtown Partnership. Three years later he signed a letter of intent to become part of the center, Leeanne Griffin reported in a 2013 Hartford Courant article. Rather than focusing solely on the student population, the Jessurum brothers sought to fill a local restaurant void for the adult population in the surrounding communities. “When I put the business plan together, I found that no (local restaurant) was catering to the adult population,” Barry Jessurum was quoted in the article as saying. 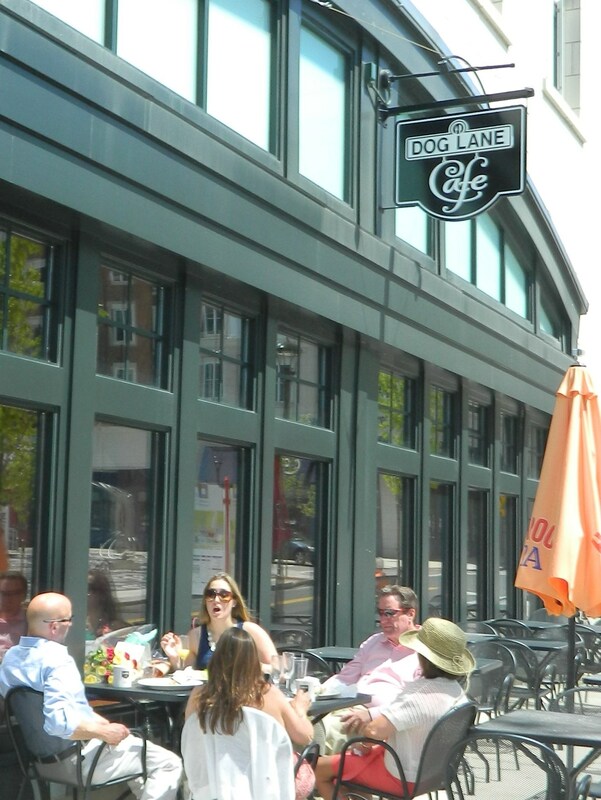 Welcome to Dog Lane Cafe. Good idea. The closing of Kathy-Johns restaurant at the nearby Four Corners where I worked back in the day as a student at UCONN, left Storrs with few restaurant selections. 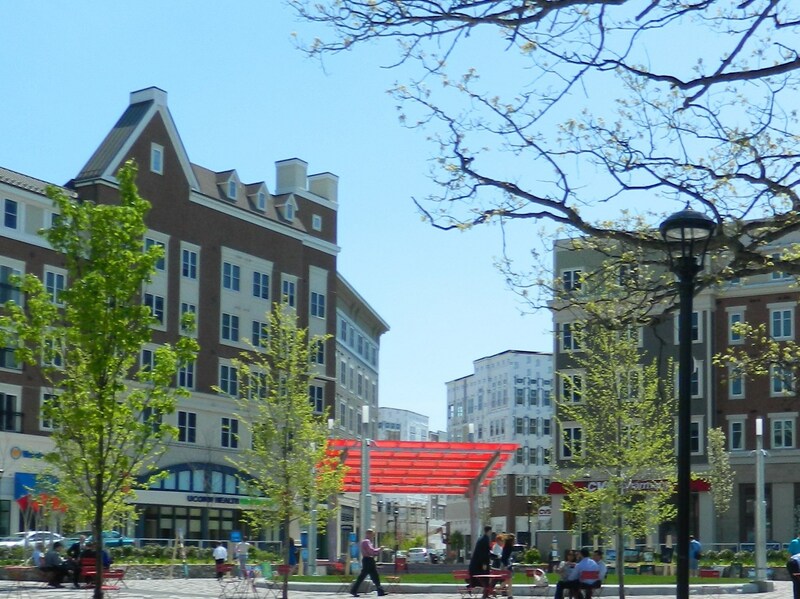 Storrs Center holds the promise of transforming UCONN into a campus that is part of a thriving college town similar to how I remember Dartmouth in New Hampshire. 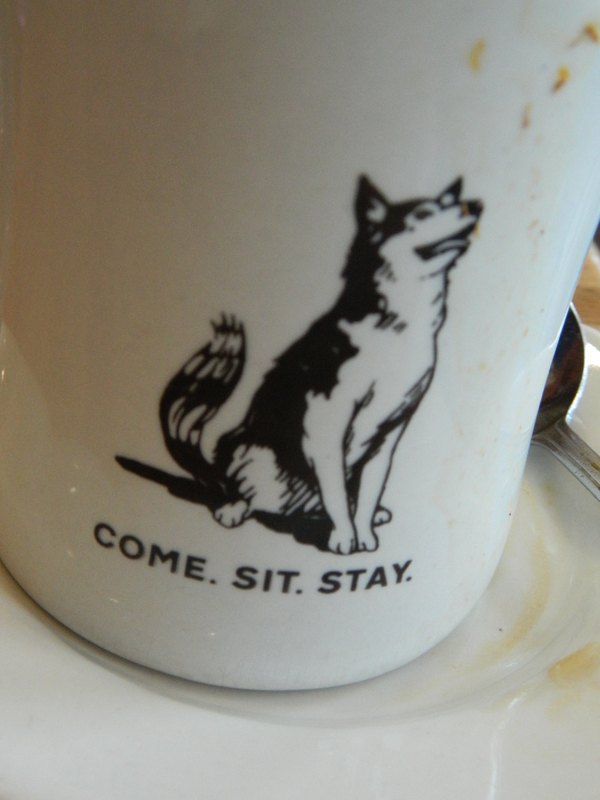 Dog Lane Cafe is not only filling a void here, but doing so in a unique-ish and pleasant way. Accurately described as open and airy, the cafe is welcoming with dining areas on adjacent sides indoors plus outdoor sidewalk seating. As with the Vanilla Bean Cafe, which I fell in love with during my first trip there this past autumn, customers at Dog Lane Cafe are greeted by an enormous, colorful, overhead chalk board listing menu items and beneath, a showcase of sweets. Homemade Chicken & Rice soup. 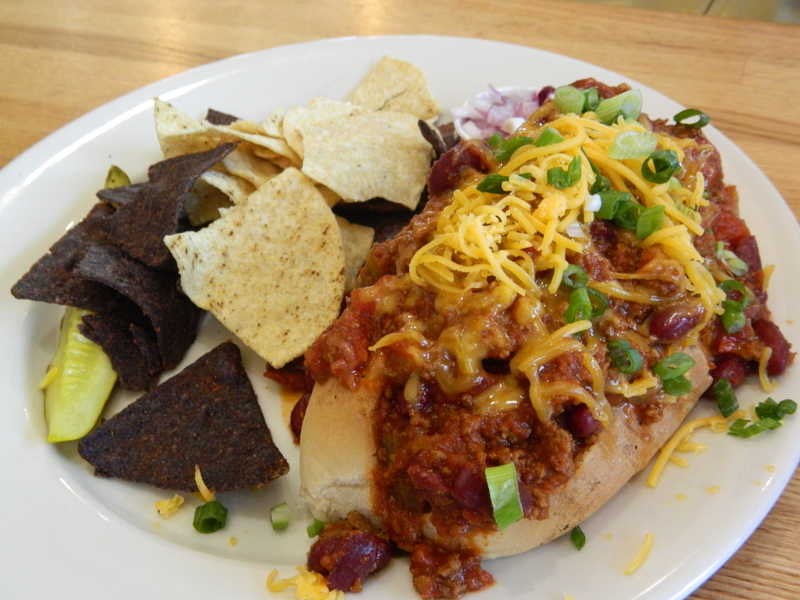 They offer an interesting variety of sandwiches, wraps, paninis, grilled burgers, hot dogs and artisan grilled cheeses such as the big Chili Dog served with black & white corn chips. 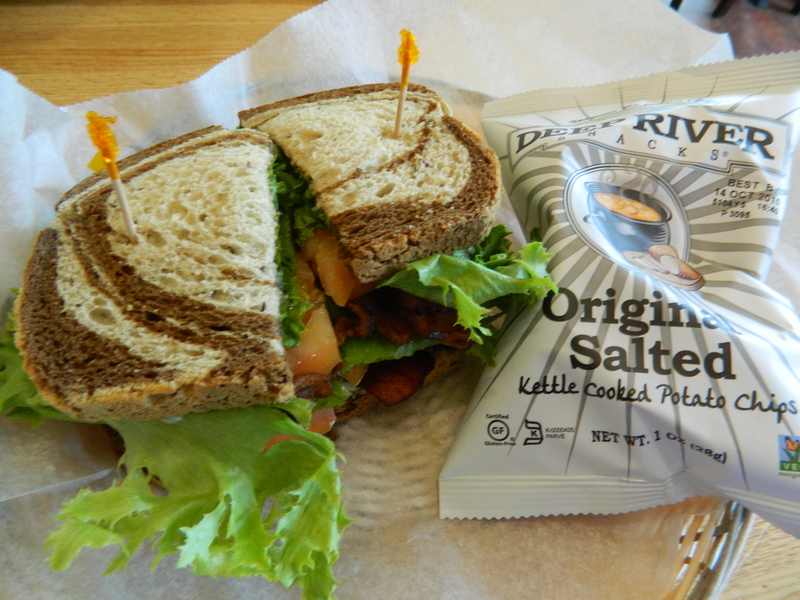 Made by request was a simple BLT on rye served with a bag of potato chips. Among the roster of “homemade” soups, was a tasty chicken with rice. As is the case at the Vanilla Bean, after ordering at the cash register customers are handed a large playing card to set on their table so servers know where to bring the order. However, you pick up your soup right away at the counter. Breakfast here includes omelettes, pancakes, egg sandwiches and morning burritos. 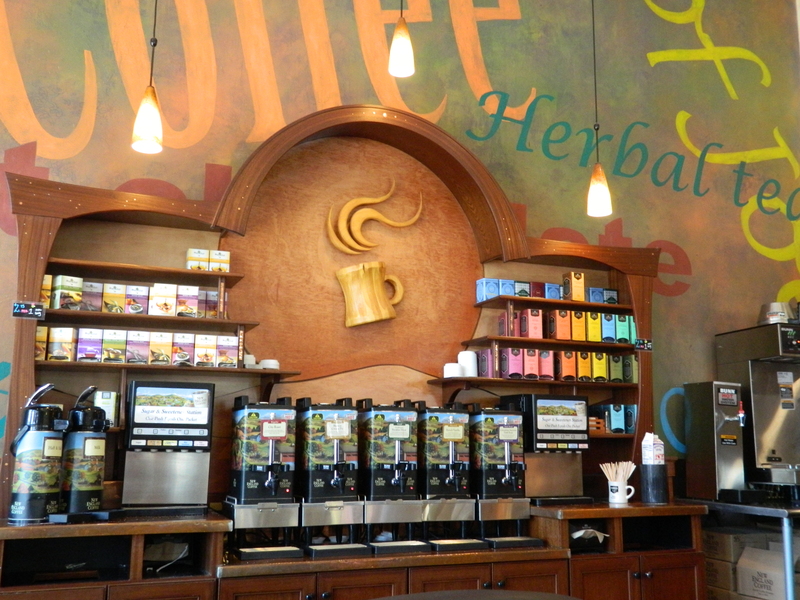 There is a coffee and tea bar against one of the far walls. Storrs Center by the main UCONN campus in Storrs, Connecticut..
Tax is already added into the purchase prices and they do not use pennies, dimes or nickels so there is no need to fumble around for change. According to its website, and how gracious of them to give credit, Dog Lane Cafe purchases from local growers during the growing season and buys specialty items from a number of vendors – the Cheeecake Factory, Devon Point Farm in Woodstock (grass-fed beef), Ducktrap River of Maine (smoked salmon, Garden of Eatin’ (corn chips), Chirardelli Chocolate, Harney & Sons Tea, Hormel (thick-sliced, applewood smoked bacon), Hosmer Mountain Soda out of Willimantic, Mighty Leaf Tea, Nodine’s Smoke House in Torrington (meats and cheeses), River’s Edge Sugar House in Ashford (real maple syrup), Shelton’s Turkey Sweet Street, Mountain Dairy of Storrs, Stonewall Apiry, Willimantic Food Co-op, Dragons Blood Elixir in Woodstock, Cato Corners in Colchester, Maple Lane Farms of Preston, Horse Listeners Orchard in Ashford, Tobacco Road Farm and Beltane Farms of Lebanon, Blue Orchard in Wallingford, Ferrari Farms of South Glastonbury, Rose’s Berry Farm in South Glastonbury, Baggott Family Farms of East Windsor and Cecarelli Farms in Northford. They have a “selection of gluten free breads” too that come from Canyon Bakehouse, Sonoma Brand and Udi’s Bread and some gluten free desserts. “We serve whole food products with minimal processing, sourced from local farmers and vendors when we can,” the site states.